Create and perform rhythms, harmonies, and melodies faster than you ever thought possible. MASCHINE STUDIO�s workflow keeps you laser-focused on the quest for the perfect groove. Its pattern-based sequencer and high-performance sampler, exemplary drum synths, incredible suite of creative effects and pro instruments, and acclaimed sound library deliver ultimate production power. And MASCHINE STUDIO�s impressive hardware delivers full tactile workflow. 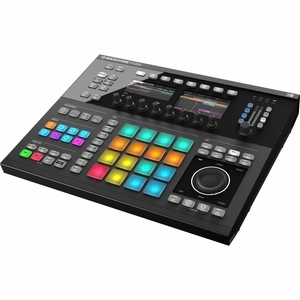 Eight display knobs, edit buttons, and a jog wheel with LED indicator provide complete tactile control of MASCHINE�s sequencer, instruments and effects. A dedicated level section delivers clear metering and monitoring. And a built-in stand delivers the perfect performance angle. Beneath MASCHINE STUDIO�s advanced hardware is all-new software � exploding with cutting-edge technology. MASCHINE 2.0 delivers a spectacular, tag-based visual browser, unlimited groups and insert effects, sidechaining, and a sleek, intuitive mixer � all directly accessible from the hardware. MASCHINE 2.0 hosts any VST or AU plug-in and perfectly integrates into any studio setup as a plug-in in all major DAWs. The software also boasts full multi-core support for ultra-fast performance. Get inspired by MASCHINE�s 8 GB library of production-ready sounds. Create your own drums with sonically-outstanding drum synths � a broad sweet spot makes it super-easy to dial in just the sound you�re looking for. Modulate 24 pro-quality studio effects directly from the hardware. Plus you get full versions of MASSIVE, PRISM, SCARBEE MARK I, and the SOLID BUS COMP.